The safest place to store your valuables may, in fact, be right beneath you while you’re sleeping. Not only does your close proximity make it difficult for thieves, an under the bed safe is also very hidden while providing easy access to owners. Even if it’s four in the morning and you’re disoriented and tired, you can easily access your weapons in case of an intruder. 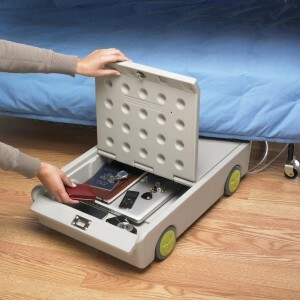 Under the bed safes are also ideal for college students who have limited personal space. Students are able to store their laptops, tablets, and prescriptions in a discreet place that also allows quick and easy access. To help those who are searching for quality under the bed safes, we have comprised a list of popular products that are available to purchase online. This product can be placed under a bed but it is not specifically made for this purpose. The lack of a sliding drawer could make it difficult to access the safe at night. However, this safe could be good for storing certain valuables and electronics. Ideal for small apartments and dorm rooms, this safe is large enough to hold laptops, cameras, and handguns. Pry-resistant steel construction that features 2 live action steel bolts, concealed hinges and a egg crate foam interior to protect delicate items. It’s also built with a wide opening to allow the user to store laptops. Easy programmable electronic lock that features a low battery warning light and a time out phase if 3 incorrect entries been made. The pre-drilled holes allow the user to attach the safe to a bed frame or another object with a security cable. It can also be bolted down with the included hardware. It also comes with 3 adjustable shelves that can be rearranged or removed to free up space. This safe was specifically made for under the bed placement. However, the lack of a digital lock makes it difficult to access this safe during the nighttime. The construction of this product makes it easy to quickly retrieve items from the bed. This product is best for private homes, especially for those looking to secure weapons under their bed. The weight and composition of this safe make it very secure against experienced thieves. Solid construction with a 16-gauage steel body and a smooth pull-out drawer that give you access to your valuables in an instant. Feature a programmale electronic lock that will give the user fast access through its keypad. User can also gain access to the safe through the key lock with the provided override key. 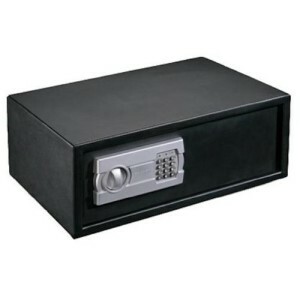 This safe can easily be bolted down underneath your bed with the pre-drilled holes and the mounting hardware provided. This safe, much like the Monster Under Bed Safe, was constructed specifically for under the bed placement. With an illuminating electronic keypad, this safe can be very easily used in the dark. This product is best for those looking to store firearms under their bed with easy access at night. The lighter weight of this safe, however, requires that it be bolted to the floor for optimal security. 14-gauge steel construction that features a unique 5-point slide locking bar and an interior with a foam padded gun tray. Features a electronic lock with a illuminated keypad that can easily be seen at night. 4 pre-drilled holes that allow the user to ground the safe to the floor to increase its security. This product is absolutely not meant for those searching for a place to store firearms. Due to the very limited security and plastic composition, this product should only be used to secure documents, medication, or certain electronics. Although the rolling feature of this safe may be appealing, it should only be used in relatively safe areas to keep honest thieves at bay. Good for young children and college dorms. 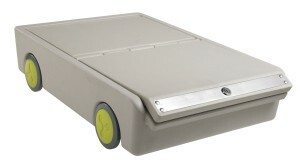 A rolling storage container that can carry up to 50 pounds. It’s low stature makes it a perfect under the bed safe. To increase the security dramatically the user can attach the safe to the bed frame with the included security cable. Most under the bed safes are constructed to fit under full sized or larger beds. Customer reviews show that many people prefer safes that have illuminated keypads and roll out drawers. These types of safes are ideal for storing protective firearms and other weapons. The majority of these safes include pre-drilled fastening holes, which allow the safes to be secured to the floor or other furniture. No matter what your purpose is, these safes provide adequate security for valuable items and can be easily installed by the customers themselves.